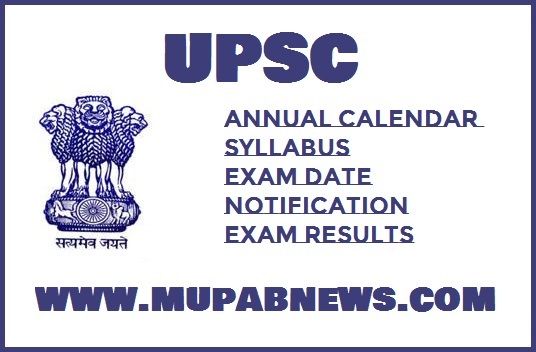 UPSC Calendar 2019 Pdf Notification : UPSC 2019 Examination Calendar pdf can be download through www.mupabnews.com. Union Public Service Commission (UPSC) released the Annual Planner for the Programme of Examination/Recruitment Test (RTs) for the Academic Year 2019-2020. In this page we Provide UPPSC exam calendar 2019 for the Candidates Who are preparing for All India Civil Service Examinations 2019 like IAS, IPS, IFOS, IRS, Central Services (Group A/B). Our Team also providing UPSC 2019 Exam Date Notification, Date Sheet, Timetable, Syllabus, study material, Strategy, Admit Card and Exam Results Videos stay tune with Mupab Studios. UPSC 2019 Examination Annual Planner Notification: Union Public Service Commission Calendar 2019 Pdf which Consists of Name of Examination Date of Notification, Last Date for receipt of Applications, Date of commencement of Exam, Duration of Exam. Hence Students/Candidates/Aspirants can use our site to Crack All India Service Exams 2019. Indian Administrative Service (IAS), Indian Police Service(IPS), Indian Forest Service(IFoS). Indian Civil Accounts Service (ICAS), Indian Corporate Law Service (ICLS), Indian Defence Accounts Service (IDAS), Indian Defence Estates Service (IDES), Indian Foreign Service (IFS), Indian Information Service (IIS), Indian Ordnance Factories Service (IOFS), Indian Postal Service (IPoS), Indian Railway Accounts Service (IRAS), Indian Railway Personnel Service (IRPS), Indian Railway Traffic Service (IRTS), Indian Revenue Service (IRS-IT), Indian Revenue Service (IRS-C&CE), Indian Trade Service (ITrS), Railway Protection Force (RPF). Armed Forces Headquarters Civil Service (AFHCS) Delhi, Andaman and Nicobar Islands Civil Service (DANICS), Delhi, Andaman and Nicobar Islands Police Service (DANIPS), Pondicherry Civil Service (PCS), Pondicherry Police Service (PPS). UPSC 2019 exam date sheet is can be also available as pdf format at end of this table.Hence Stay Tuned with Muapb News Team through Social Medias Like our FB page, Watch Exam Notification Videos @ Youtube (Mupab Studios), Follow us on Twitter and Subscribe our mail to receive notification.